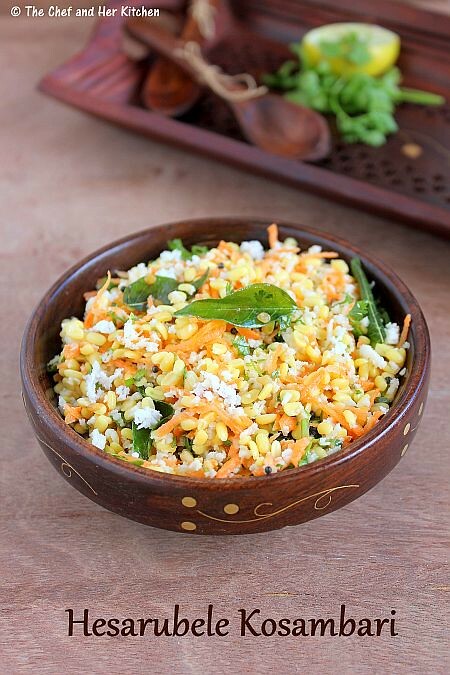 Salads can be served as a part of a meal while few varieties can be eaten as a whole meal by itself.The Salad which I am sharing today is a typical Karnataka style called 'Kosambari' which is a must to be served as a part of the meal in marriages and festivals.We usually offer soaked moong dal to God during festivals and mostly it is converted to this tasty kosambari for our lunch or evening snack.I don't mind eating it as a meal too as I like it very much.While the base ingredients of various kosambaris are same,one can play with the addition of few more vegetables or experimenting with various lentils. If you are searching for Navratri recipes,please go through my Navarathri recipes here for various sundal, kheer, snack and rice varieties. Soak moong dal for an hour and drain off the excess water in a strainer.Leave it in strainer for sometime so that all the water would be strained. 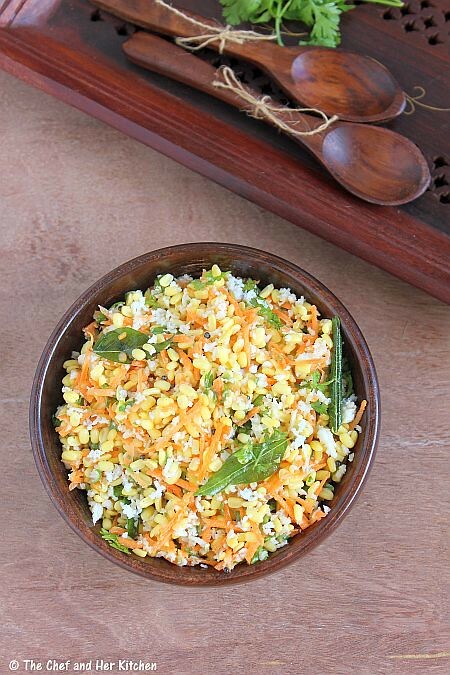 In a mixing bowl add strained moong dal,grated coconut,chopped coriander and grated carrot. Just before serving,add salt,green chili paste and lemon juice and mix well.Taste it and adjust according the seasoning according to your requirement. In a small pan heat oil and crackle mustard seeds and add urad dal and fry until it turns red.Add curry leaves and asafoetida and fry for few more seconds. Add the seasoning to the mixed salad and mix it nicely. Serve it as a snack or as a part of meal. Prepare the salad just before serving,if you make it ahead the salad will leave lot of water.Hence add the salt and spice and mix just before serving.You can make ahead of half an hour and not more than that. You can add finely chopped cucumber and also finely chopped or grated raw mango to the above recipe.Adjust lemon juice in the recipe. 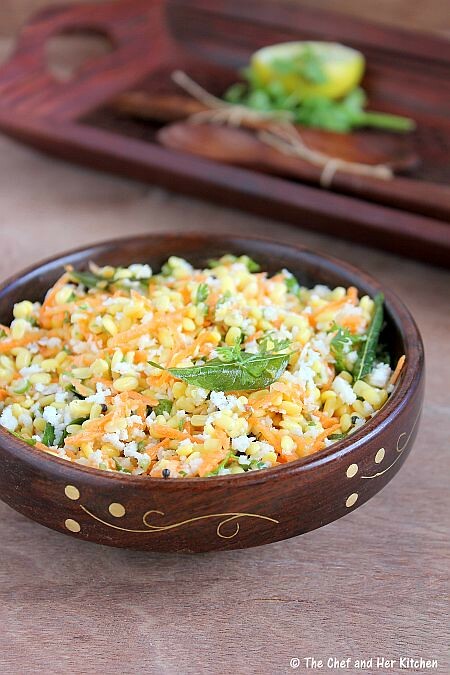 Moong dal can be replaced with chana dal in the recipe and follow the same process. You can even add pomegranate kernels to the salad. 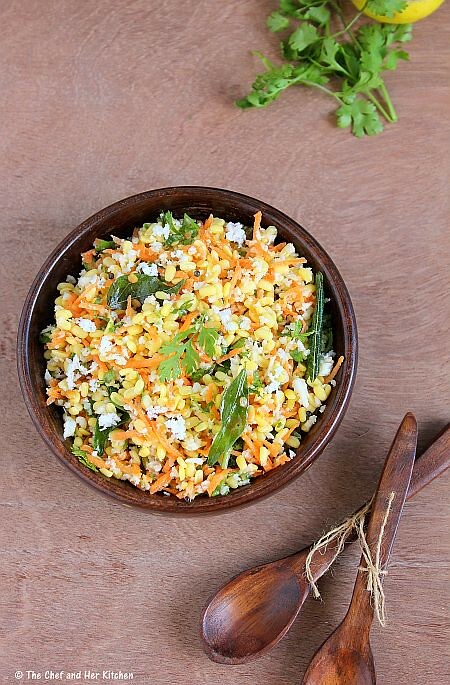 Yellow moong dal can be replaced with sprouted whole moong in the recipe and you can add chopped cucumber and raw mango to the same. Nutritious and healthy salad, love it. 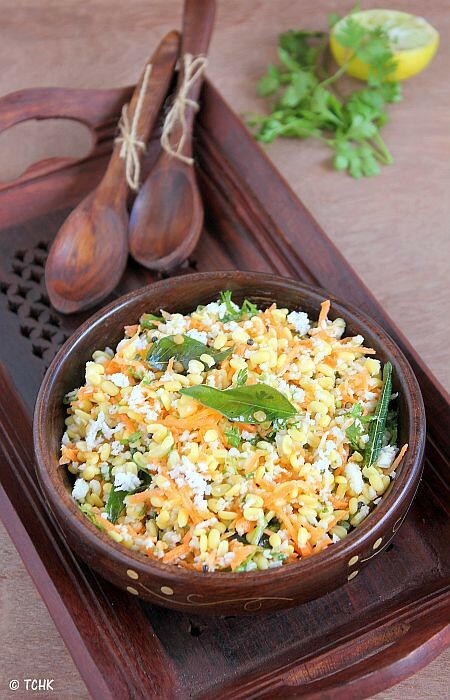 I love this salad..lovely clicks.. 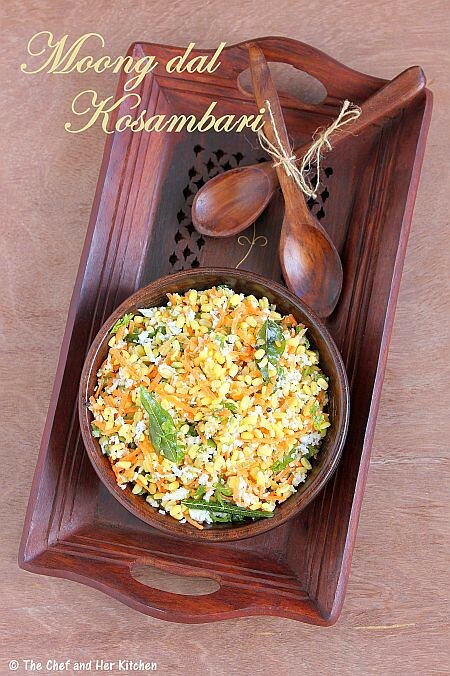 Healthy and delicious kosambari.. Nice clicks..
Love hesarubele kosambari anytime. Pictures are awesome!